NEW: Click here for online registration/payment for all five sessions ($100). Note: amount goes up after Oct 10! 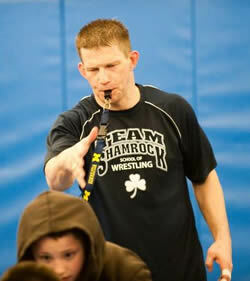 We are excited to be hosting Mike Krause of Next Level and Shamrock Wrestling Clubs in a clinic Oct 17-19. Mike is a nationally recognized youth and club coach who does clinics and camps all over the U.S. He has been a featured clinician at the Monterey coaches clinic in the past. Click here for an informational flyer and registration form. Donation amounts are very reasonable. 5 sessions of great technique instruction, plus a scrimmage (for the wrestlers) and Q & A (for coaches and parents) Saturday after the third session. We are limiting space to the first 75 who register, so get on this while spots are open! This clinic is for all grades, K-12. Simply put….he brings the HEAT!